GemFire’s management and monitoring system consists of one JMX Manager node (there should only be one) and one or more managed nodes within a cluster. All members in the cluster are manageable through MBeans and GemFire Management Service APIs. The following diagram depicts the architecture of the management and monitoring system components. Local MXBeans that represent the locally monitored components on the node. See List of GemFire JMX MBeans for a list of possible MXBeans existing for the managed node. A JMX Manager node is a member that can manage other GemFire members –that is, other managed nodes – as well as itself. A JMX Manager node can manage all other members in the cluster. To convert a managed node to a JMX Manager node, you configure the GemFire property jmx-manager=true, in the gemfire.properties file, and start the member as a JMX Manager node. You start the member as a JMX Manager node when you provide--J=-Dgemfire.jmx-manager=true as an argument to either thestart server or start locator command. See Starting a JMX Manager for more information. RMI connector that allows JMX clients to connect to and access all MXBeans in the cluster. Local MXBeans that represent the locally monitored components on this node, same as any other managed node. 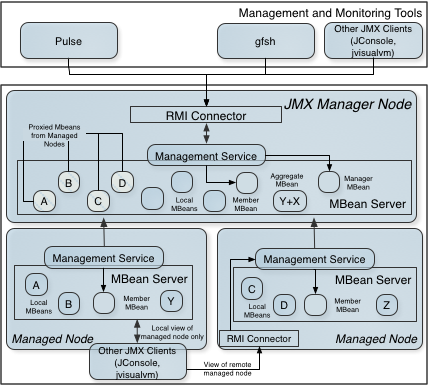 ManagerMXBean with Scope=ALL, which allows various cluster-wide operations. Proxy to MXBeans on managed nodes. Management and monitoring tools such as gfsh command-line interface and Pulse use JMX/RMI as the communication layer to connect to GemFire nodes. All GemFire processes by default allow JMX connections to the Platform MBeanServer from localhost. By default, both managed nodes and JMX manager nodes have RMI connectors enabled to allow JMX client connections. JConsole (and other similar JMX clients that support Sun’s Attach API) can connect to any local JVM without requiring an RMI connector by using the Attach API. This allows connections from the same machine. JConsole (and other JMX clients) can connect to any JVM if that JVM is configured to start an RMI connector. This allows remote connections from other machines. JConsole can connect to any GemFire member, but if it connects to a non-JMX-Manager member, JConsole only detects the local MBeans for the node, and not MBeans for the cluster. When a GemFire locator or server becomes a JMX Manager for the cluster, it enables the RMI connector. JConsole can then connect only to that one JVM to view the MBeans for the entire cluster. It does not need to connect to all the other JVMs. GemFire manages the inter-JVM communication required to provide a federated view of all MBeans in the cluster. gfsh can only connect to a JMX Manager or to a locator. If connected to a locator, the locator provides the necessary connection information for the existing JMX Manager. If the locator detects a JMX Manager is not already running in the cluster, the locator makes itself a JMX Manager. gfsh cannot connect to other non-Manager or non-locator members. For information on how to configure the RMI registry and RMI connector, see Configuring RMI Registry Ports and RMI Connectors. GemFire management APIs represent the GemFire cluster to a JMX user. However, they do not provide functionality that is otherwise present in JMX. They only provide a gateway into various services exclusively offered by GemFire monitoring and management. The resulting ManagementService instance is specific to the provided cache and its cluster. The implementation of getManagementService is a singleton for now but may eventually support multiple cache instances. Monitor the health status of clients. Obtain the status and results of individual disk backups. View metrics related to disk usage and performance for a particular member. Browse GemFire properties set for a particular member. View JVM metrics such as memory, heap, and thread usage. View network metrics, such as bytes received and sent. View partition region attributes such as total number of buckets, redundant copy, and maximum memory information. View persistent member information such as disk store ID. See the JavaDocs for the org.apache.geode.management package for more details. You can also execute gfsh commands using the ManagementService API. See Executing gfsh Commands through the Management API and the JavaDocs for the org.apache.geode.management.cli package. gfsh. Pivotal GemFire command-line interface that provides a simple & powerful command shell that supports the administration, debugging and deployment of GemFire applications. It features context sensitive help, scripting and the ability to invoke any commands from within the application using a simple API. See gfsh. GemFire Pulse. Easy-to-use, browser-based dashboard for monitoring GemFire deployments. GemFire Pulse provides an integrated view of all GemFire members within a cluster. See GemFire Pulse. Pulse Data Browser. This GemFire Pulse utility provides a graphical interface for performing OQL ad-hoc queries in a GemFire cluster. See Data Browser. Other Java Monitoring Tools such as JConsole and jvisualvm. JConsole is a JMX-based management and monitoring tool provided in the Java 2 Platform that provides information on the performance and consumption of resources by Java applications. See http://docs.oracle.com/javase/6/docs/technotes/guides/management/jconsole.html. Java VisualVM (jvisualvm) is a profiling tool for analyzing your Java Virtual Machine. Java VisualVM is useful to Java application developers to troubleshoot applications and to monitor and improve the applications’ performance. Java VisualVM can allow developers to generate and analyse heap dumps, track down memory leaks, perform and monitor garbage collection, and perform lightweight memory and CPU profiling. For more details on using jvisualvm, see http://docs.oracle.com/javase/6/docs/technotes/tools/share/jvisualvm.html.